Add capability for numerical 3D reservoir model to simulate cases with constant pressure boundary con-ditions. Added non-Darcy flow calculations for oil wells to 3D reservoir model. Increased number of layers for input to 100+. Added new input allowing for “Detail Fluid Loss”. That is, input may be specified for formation permea-bility, reservoir fluid properties, etc., and the appropriate fluid loss coefficient is used automatically (or for the E-StimPlan Coupled Model, the input is used directly for a rigorous simulation of the fluid loss process). Expanded the ability to define layer properties (modulus, fluid loss, etc.) by “Name”. This is also used, for example, to shift the stress in all “My Formation Shale” layers, making it possible to change modulus, stress, etc. in several formation layers in unison. This now allows the building of a “database” of formation properties and the repaid creation of a “geologic model” for a particular well. Further expand “Create New Dataset” input “Wizard” to assist with starting from scratch to create a new dataset. Add FULLY COUPLED FRACTURE GEOMETRY MODEL WITH 3D RESERVOIR MODEL including poro-and thermal effects for thermal fracturing. This provides the most advanced simulation capabilities existing for water injection, waste-water disposal, drill cuttings injection, and for hydraulic fracturing in very high permeability environments (where many normal one-dimensional fluid loss assumptions used in fracture simulations are NOT appropriate). ACID FRACTURING MODULE! More information will be released on this later, and significant improve-ments are already under development for future releases. The goal is for this “Version 1.0” to be the best acid fracturing simulator available, with significant enhancement yet to come. To achieve this, we are proud to an-nounce our association with Professors Dan Hill and Ding Zhu at the University of Texas for this development. Significant improvement in E-StimPlan/Fully 3D solutions for “soft rock” cases. Complete re-write of E-StimPlan/N-Fracs/Fully 3D to include FEM capability (for layered modulus) for all models, and to improve run time speed and eliminate the intensive memory requirements. Added capability to reservoir model to simulate production from multiply fractured horizontal wells. Add capability to Log Module to automatically determine stresses/stress gradient/modulus from calculated log tracks for these variables. Layering is then transferred directly to StimPlan for simulation. 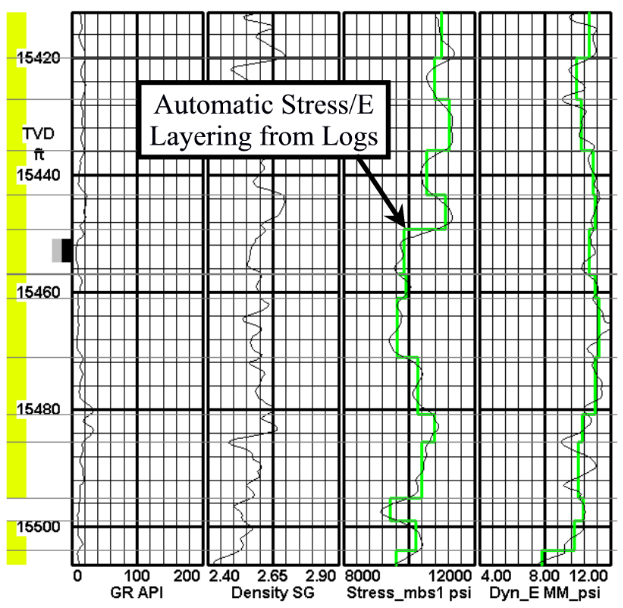 Add ACA (After Closure Analysis) for determining forma-tion permeability from injection/decline (i.e., stress test/ mini-frac data) tests. Well Test Analysis – Complete capabilities for importing/analyzing pressure build-up data including Horner, Square-Root, and ¼-Root Analysis, Type Curve Matching, etc.